However, while getting down to an armwrestling training it is worth to remember that although age is a slight limitation in achieving high sports results, training mainly in the direction of armwrestling, this success could be achieved much faster than expected. While specialist training and also in terms of only one sports discipline, a competitor can achieve quite high sports results even over forty. In Poland there are many competitors representing the masters class, so armwrestlers over forty years old who have long since come to like our sport. They are both those who have been actively practicing armwrestling for some time and are successful on the national and international arena, and those who are slowly put into the secrets of armwrestling. We would like to encourage athletes in this particular age to train armwrestling. We hope that the following training with a forty years old beginner - Waldemar Michalski from Zloty Tur Gdynia club (Poland) - will help you in making up the right decision. 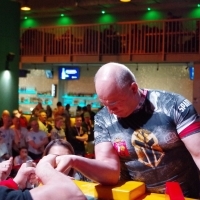 Waldemar Michalski is a masters class competitor, who started his adventure with Armwrestling at the end of 2009. Beginning competitors (in this case Waldek was not the exception either) have weak wrists and fingers. The large disparity in strength between the wrist and the biceps may even lead to injury during the fight. After several consultations with experienced competitors in Zloty Tur Gdynia club he decided to make up for the missing link. As you can see in photos Waldek has a quite powerful biceps (he previously trained body-building). As the initial trainings showed disproportion to the wrist was significant. Thus the main emphasis from the very beginning Waldek put to practice the wrist. Of course, he did not neglect the other groups of muscle and angles. And although at the beginning of his career, his wrist still left much to be desired, through regular and specialized trainings he consecutively developed manners at the table. Below we present 5 major classes of Waldemar Michalski’s exercises, which we can confidently recommend to any beginner, both young and older armwrestler. Of course, we would like to remind you that any training must start with a good warm-up. We hope that you will never forget about it. Waldek departed from the traditional exercises on the wrist (dumbbell lifting) in aid of pulling down on an adjustable lift. Thus, in a few weeks he adds 5-7 kg in weight. Waldek performs these exercises in 4 series of 8-10 repetitions, increasing weight in last series. This is a classic exercise for any beginning competitor, giving a large side pressure. Additionally this exercise helps you develop the coordination of movement. Waldek performs this exercise in 4 series of 6-10 repetitions, increasing weight in last series. Lifting up on biceps by under hold from the right angle on a mechanical curl gives the possibility of acquire skill force in the angle between the forearm and shoulder, which is necessary during a fight at the table. Waldek performs this exercise in 5 series of 6-10 repetitions, increasing weight in last series. It is a leading exercise of each armwrestler, necessary to attack and defend from the top. Same as the previous exercise it is performed from the angle of 90 degrees. Waldek performs this exercises in 5 series of 6-10 repetitions, increasing weight in last series. This is another major exercise of each armwrestler. It is performed on a universal combine by under hold. A weak grip is what Waldek has been trying to improve for several months. Waldek performs this exercises in 5 series of 8-12 repetitions for each hand.